PHOTO FEATURE: The weather could only be described as glorious when Norwegians gathered in Oslo on Liberation Day to remember their military veterans and war heroes on the 73rd anniversary of Norway’s liberation from Nazi German occupation. Merchant marine veterans were given the credit they also deserved, at an outdoor ceremony fittingly held on the waterfront. 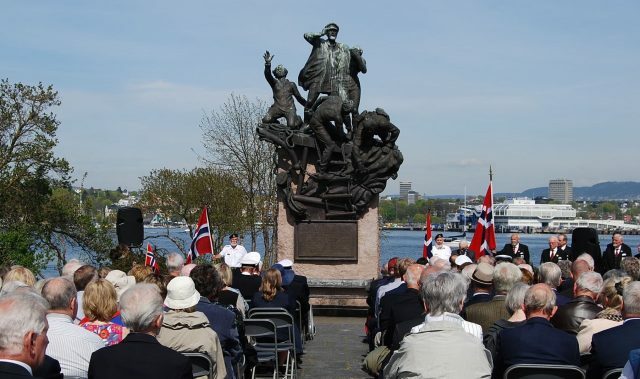 The Norwegian Maritime Museum hosted the event outside its building on Bygdøy, at the site of the monument that was finally erected to hail the seafarers known as krigsseilere in 1980, 35 years after World War II ended. The sunny skies and warm breeze blowing off the Oslo Fjord were in sharp contrast to the freezing North Atlantic that the seafarers braved during convoy duty to bring critical supplies to war-torn Great Britain and carry out other missions for the allies. 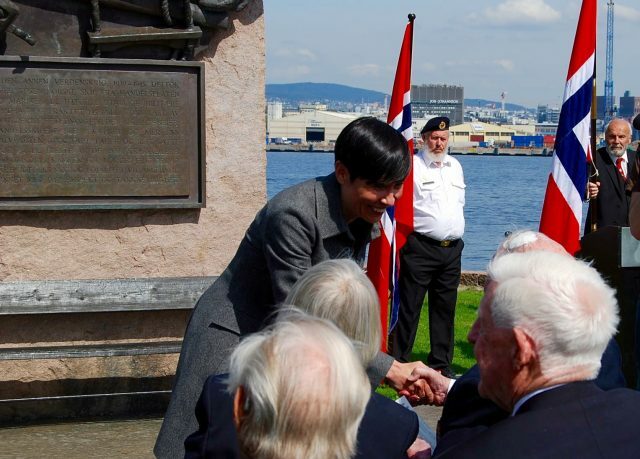 Foreign Minister Ine Eriksen Søreide greeted one of the last surviving merchant marine veterans and then spoke frankly about how the Norwegian government and shipowners for which they’d served let them down, by denying them war benefits or even pensions. Søreide called their poor treatment after the war as “a sad and unworthy chapter” in Norway’s wartime history. Both Søreide and other speakers also paid tribute to author Jon Michelet, who died last month just after completing his wildly popular series of books about the wartime seafarers that struck a collective nerve in Norway. Søreide mentioned how Michelet’s books, “in a completely unique manner,” told their story and described their courage and endurance. 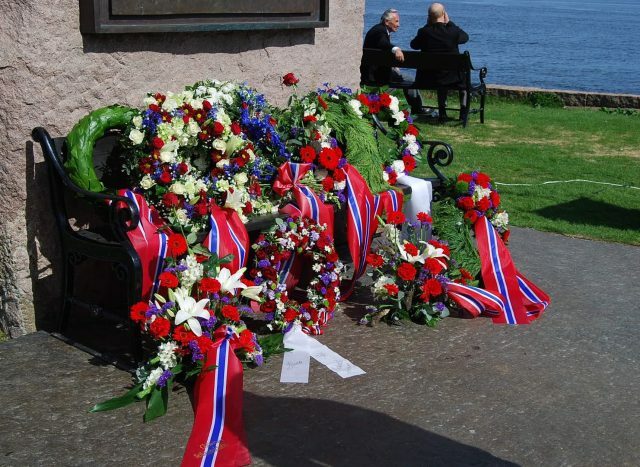 Wreaths and other tributes had piled up by the time the memorial was over, placed by the government, Norway’s naval defense and several seafarers’ organizations. After the speeches and songs performed by Det Norske Sjømannskor (The Norwegian Seaman’s Choir), the group gathered for coffee and cake inside the Maritime Museum, which has mounted an exhibit to krigsseilere during World War I as well.